Throw another level of excitement to your child's birthday party by adding on our Bubble Burst! We will unleash a gigantic burst of bubbles twice during the play time in Arena B! 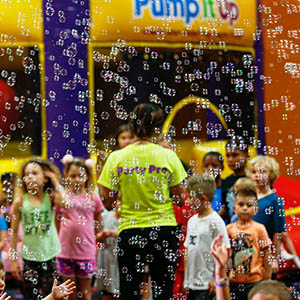 Kids LOVE bubbles and they will love it here at Pump It Up! Glow Wars NOW AVAILABLE! Add to any party package for an additional $55 for up to 25 kids. Additional kids over the 25 included are $4.95 each (maximum of 30 children). Kick our Glow Party up a notch with Glow Wars! 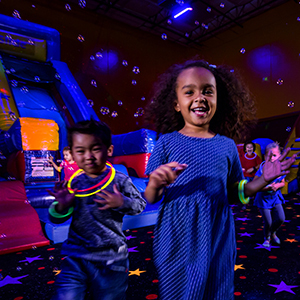 This experience includes Glow Lighting, Glow Necklaces and the use of our Glow Moon Blasters for each child in Arena B. Kids and parents are easy targets for the soft pong balls that Glow In The Dark as they soar through the air. Book your kids birthday party today and add the Glow feature. This is sure to be a hit with all the kids! SFX lighting is offered in Arena B. All the kids will get glow necklaces and the guest of honor will receive a special LED Glow Wand! Add our Jump n Jam Package on to any party! The kids will sing all the latest songs on a professional karaoke system in Arena B while the party is going on! This goes great with the Glow Party! Pumpjama is a great idea for the kids that LOVE going out in their jammies! All the kids show up in their PJ's.... great theme for our Early Bird Breakfast Parties or our Late Night Jump n Jam Glow Parties! All ages love it!! 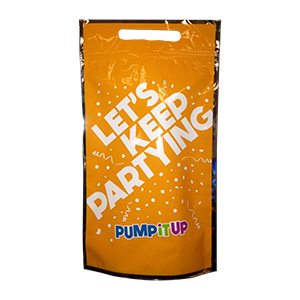 This bag includes a variety of fun toys and novelties to enjoy all packaged in a Pump It Up Branded Cup! 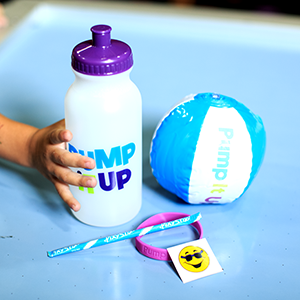 A Pump It Up Branded Water Bottle filled with fun novelties-Fun Dip, Punching Bag Ball, Finger Trap Game, Tattoo & a Slap Bracelet. Contents may vary. Choose color.